Conventional basement finishing products are often inappropriate for the basement environment. Materials such as drywall, latex paint, wallpaper, wood, and fiberglass resins all contain organic materials that can grow mould and be damaged by moisture. For a free basement wall quote, call or e-mail us today! 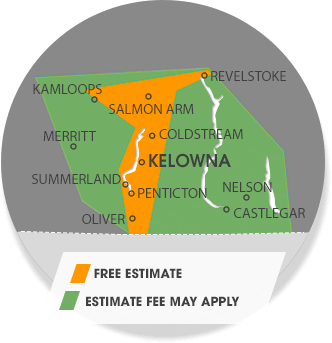 We proudly service British Columbia, including Vernon, Kamloops, Kelowna, Nelson, Quesnel, Penticton, West Kelowna, Salmon Arm, Castlegar, Williams Lake, Winfield, Westbank, Coldstream, Trail, Oyama, Chase, Armstrong and nearby. If you're interested in an easy way to upgrade your basement walls, there's nothing quite like the CleanSpace® Wall System. Like our other wall systems, it can hold back water vapor passing through your foundation walls, directing it to your sump pump. With anti-microbial protection called UltraFresh built right in, no mould or mildew will grow on the CleanSpace! If your basement has been finished with drywall, it could be seriously damaged during a flood. Once drywall is damaged by water, mould is not far behind. But it's just the bottom of the walls that need replacing, right?